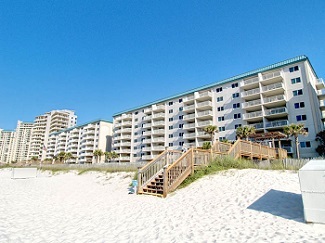 Misc: 2 Bedroom, 2 Bath beachfront unit with 1,200+/- sq. ft.
Sandy Key beachfront condo for sale in Pensacola Florida. 2BR/2BA fully furnished condo with coastal decor, Sandy Key 325, to find a spacious layout with plenty of room to relax and enjoy the gulf front vistas. The unit boasts a fully-equipped kitchen, large dining area, and living room with a true coastal feel. Tile throughout kitchen and living room. The guest bedroom features a new king size bed, flat screen tv and beautiful coastal decor. You'll also find a king bed and flat screen tv in the spacious master that has windows overlooking the gorgeous Gulf and sliding glass door leading you right out to the balcony from your bedroom. Plenty of your time will be spent out on the expansive, private balcony. Start and end your days out on the balcony, reminiscing about your day’s activities and enjoying sweeping Gulf views. The condo comes with an assigned first floor storage unit. Access to the emerald Gulf water is found mere steps from the complex. Make this property your beach retreat and take advantage of all of Sandy Key’s amenities. Don’t wait, come see this condo today! Perdido Key FL is the perfect place for a family vacation to enjoy popular outdoor activities in a sub-tropical climate on the Gulf Coast – this resort community is a great place for families. Experience popular Perdido Key restaurants like the Fisherman’s Corner, Sea-n-Suds, The Crab Shack, Lillian’s Pizza, etc. and enjoy some of the freshest seafood anywhere. There’s a variety of resort property including a variety of Perdido Key condos for sale, for those interested in their own slice of paradise.. Whether you're ready for fun and adventure, a relaxing day on the beach, a real estate investment, or tasty cuisine – you can find it all on Florida's Gulf Coast.